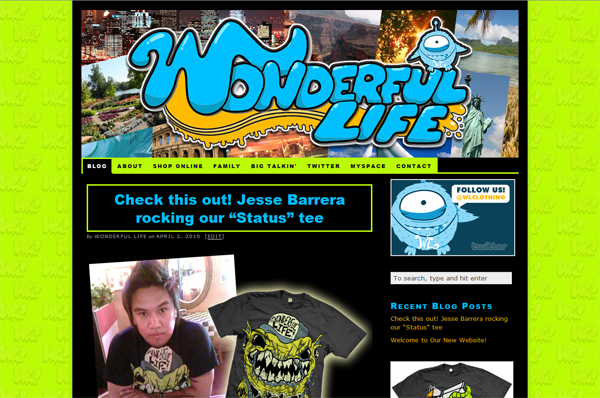 I have worked with Wonderful Life Clothing for almost a year now helping them out with online promotions and technology. This latest redesign as shown how much we have both grown in that year. When I first designed the website Matt Gondek, owner of WL clothing, and I didn’t really know what we wanted to do. Since the brand was so new we didn’t really have a direction we wanted to go for the design of the site. 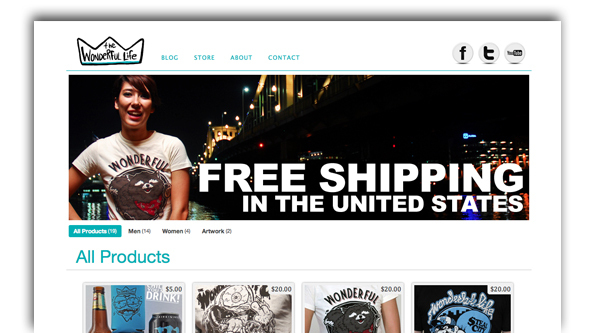 When I created version 1.0 of the site I just took the colors and design elements from the shirts themselves. Doing this, I created a bright neon website that at the time fit the brand. At that time we also didn’t know what features we would need one the site so we kind just though things together as we needed them. I usually don’t like to do that, but sometimes you just have to get the website up before you can see what you need. Building the site on WordPress made it so we could add features, as we needed them. Also since all the content for the site was going to be in a database, a future redesign would not be a big deal. Now a year later, Matt, Mick Neal (marketing guru for WL Clothing), and I have a better idea of what we needed. The redesign took a day of brainstorming (talking over a few beers and bar napkins) and about two days to get it executed. The reason for the quick turn around time was after a year we know what worked and what didn’t on the site. We also knew what customers expected and what the brand needed to be. WordPress made is possible to launch a website quickly, allow it to evolve, and then morph in to a beautiful butterfly. That’s the great thing about the Internet, you can always change with the times.